The first teacher to call in was NYI's Walter Karling, and his voice mail message was brief. "Look at the front page of today's Times," he advised. "Another victim of auto focus." He was right. That particular October morning, there on the top of page one was a photo of a historic event the night before - then President Bill Clinton had attended a labor dinner with Teamster President James Hoffa. The photo showed the two men shaking hands. Whatever your opinion of labor, the Teamsters, or former President Clinton, this was news. It was, as the article explained, the first time that a US President had attended a function with the leader of the powerful Teamsters Union since Franklin Delano Roosevelt had done so over fifty years before. The problem was, both Clinton and Hoffa were slightly out of focus. The camera of the Times photographer had focused on a portion of a sign perhaps ten feet behind the two men. The sign was razor sharp, but there wasn't enough depth of field to keep the two subjects of the photograph in sharp focus. Hard to believe? It's not. It happens to all photographers who use auto focus now and again. It happens less to pros using single lens reflex cameras than amateurs with a point-and-shoot, but it does happen. Particularly when you're photographing Presidents and presidential candidates, there's a lot of hustle and bustle, crowds and Secret Service people and usually, only a few seconds to get the shot. It's easy to miss the proper spot for auto focus. 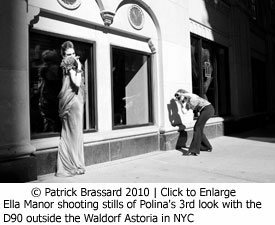 But for most photographers, most of the time, there's plenty of time to avoid this problem, but nevertheless, the subjects are out of focus, automatically. In previous photography articles on this site, we've discussed two culprits that make soft photos-slow shutter speeds and camera shake. Yet with today's fast films and efficient flashes, these gremlins are usually a problem only in low light situations or when the camera is being used by a very inexperienced photographer. But what we can call "auto mis-focus" is common and can happen under virtually any lighting conditions. I should add that Walter, who works regularly as a photojournalist, was a reluctant convert to auto focus cameras. But, along with all news photographers, he did change to auto focus equipment in the past decade. There are many times when auto focus and auto exposure make it possible for news photographers to get photos that they would have been unable to capture in the past. It's the same for nature, sports and action photographers who seek to capture fast-moving subjects. Plus, there only a few cameras on the market today that aren't auto focus. Yet auto focus can let you down if you're not careful. Here's why: The camera doesn't know what you intend to be the subject of your photograph, and the auto focus system in virtually every model is set to focus on whatever is in the center of the camera's frame. That's fine as long as your subject is in the center of your camera's frame. However, there are lots of times when your subject is not in the center of your frame. Several common situations are when there are two people side by side, like Clinton and Hoffa, and a clear view of the background in the center of the frame. You'll fall prey to the same problem if you want to photograph Grandmother and Grandfather in front of the Christmas tree. Auto focus will focus on the background every time in that situation unless you tell it not to do so. So too, if you're photographing your spouse at the Grand Canyon, if the person is off to one side, the camera will focus on the horizon or far side of the Canyon. For this type of photo, you need to have both the person and the Canyon in sharp focus. There is a solution, and it's easy to use, as long as you remember to do so. It's called focus lock. 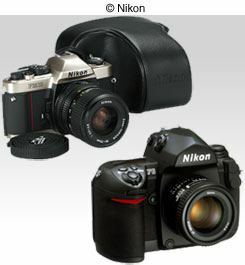 All auto focus cameras - both digital and film models - focus before the photo is actually taken. Generally, the focusing takes place when you press your camera's shutter release button halfway down. That causes the camera's lens to focus on whatever is in the center of the frame when you begin to press the button. So here's how you use focus lock. Before you actually take the photograph, place your subject dead center in your viewfinder. Press halfway down on the shutter button, but just halfway down, so the shutter doesn't go off. By pressing halfway down, you've locked the focal distance on your subject even if you move the camera, as long as your finger continues to hold the shutter button halfway down. As long as you continue to press the shutter button, the focus stays set at the distance you've "locked in," which is the correct distance to your intended subject. So now, with your finger still holding the button halfway down, reframe the picture in your viewfinder the way that you want it, with the subject placed off center. When you have the composition set the way you like, you take the picture by pressing the rest of the way down on the button. Presto! Your subject is fully in focus even though you placed it off center in your picture. Here's an example of how it works. Look at these three photos. If you don't use focus lock, the model on the left of the frame will be out of focus because the sensor chooses to focus on the chairs at the far end of the pool. [A] So, put the subject in the center, press down and lock focus on her [B]. Then, recompose and take the photo. [C] Easy! You should do this every time you use a point-and-shoot camera to frame an off-center subject. Remember to use focus lock. You won't have this problem with a fixed-focus camera such as a single use "disposable" model. Why? Because there is no adjustable focus whatsoever in these models. (By the way, 170 million disposable cameras were sold in the U.S. in 2002.) One reason people like these handy inexpensive cameras is that as long as there's enough light and the subject isn't moving and is four feet or more away from the camera, the photo will be sharp. "Auto mis-focus" is particularly common with point-and-shoot models because you don't see what the film is seeing. The viewfinder is a separate window and everything in it is always in focus. With an SLR, because the viewfinder shows you a view of the scene using the camera's lens, you're more likely to see that the point of focus is misplaced, thereby being reminded to use focus lock. But in low light, or in rushed situations, it's too easy to miss the problem even when using an SLR. The best approach is to train yourself to always use focus lock when the subject isn't dead center in your viewfinder. That way, you'll always have sharp photos of your precious memories to enjoy. By: Richard Martin on March 15 2006.